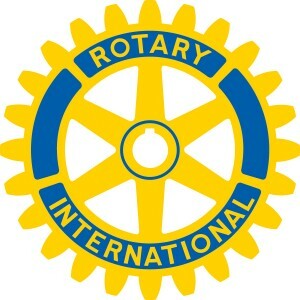 Welcome to the Rotary Club of Naperville – Downtown! Greetings! Thanks to all who joined forces to volunteer and/or generously donate to the Hurricane Florence Relief Effort hosted by Rotary Clubs of Naperville! Click here to see photos & story! The Rotary Club of Naperville / Downtown is one of four Rotary Clubs serving Naperville, Illinois. Chartered in February 2007, RCN/ Downtown is a member of Rotary International and District 6450. The Club meets weekly at 4:44PM on most Wednesdays in the Fish Pond at Hugo’s Frog Bar and Fish House in Main Street Promenade, located at 55 South Main Street in downtown Naperville. Typically, members start arriving at 4:30PM for fellowship and fun, take attendance at 4:44PM and begin the official meeting at 5PM where the focus is on engaging and enlightening programs, complete with Q&A. Look for the yellow Rotary signboard in the plaza for directions to the meeting room. All Rotarians from around the world are welcome as well as those community-minded individuals interested in the weekly educational program. The guest fee is $20 which includes delicious appetizers and assorted beverages and/or wine graciously provided by RCN/Downtown and Hugo’s. Whether a Rotarian or not, guests always are welcome to this casual small interactive club. Meeting & Notes Schedule / 4:44 Rotarians work together to plan enlightening programs throughout the year. Members are responsible for arranging programs and contacting the Program Coordinator with ideas for the calendar. Note: Founded in 1917, the Rotary Foundation is a nonprofit corporation that “supports the efforts of Rotary International to achieve world understanding and peace through international humanitarian, educational, and cultural exchange programs.” The Rotary Club of Naperville/Downtown also commemorates more than 100 years of the Rotary Foundation with tributes to the programs it has supported through life-changing service. 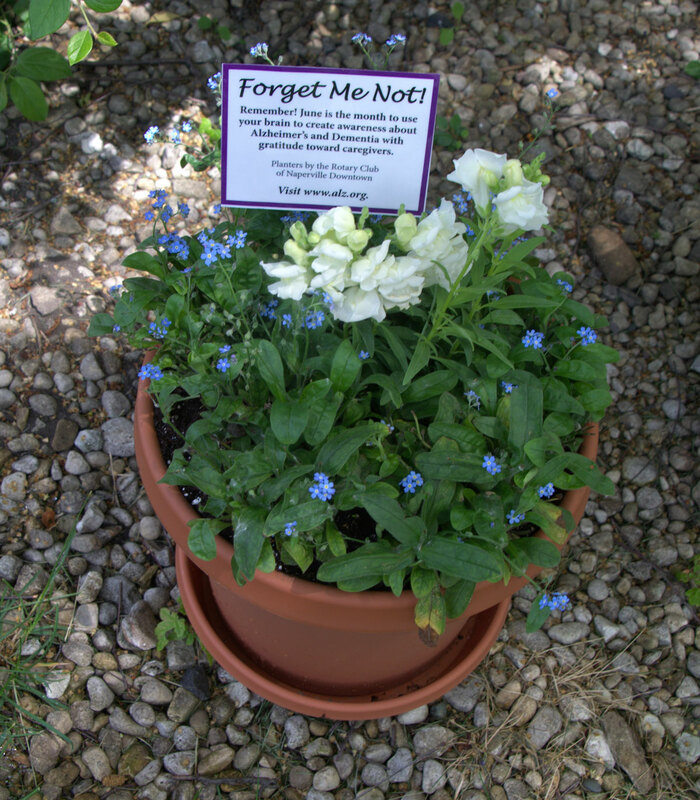 In recent years, planters of forget-me-not flowers were placed at the businesses of Rotarians to grow awareness about Alzheimer’s. Forget-me-nots are reminders that during the month of June, individuals worldwide are asked to take the Purple Pledge. Use your brains to fight Alzheimer’s Disease and Progressive Dementia! For information about a Rotary initiative highlighted in the April 2015 Rotarian Magazine titled “Slow Fade, New Hope in the Fight to Stop Alzheimer’s,” click here. Now designated to become an annual service project, look for the planters mostly at local independent businesses with a few in front of homes of Rotarians. In addition to raising awareness about Alzheimer’s and Dementia, the Rotary Downtown initiative provides an opportunity to express gratitude to helpful caregivers and compassionate hospice volunteers. The Rotary Club of Naperville/Downtown hosts one annual fundraiser, Rotary Ride, in memory of Carmen DiGiovani. Thanks to all cyclists and sponsors that have participated in Rotary Ride since its beginning when it was first imagined by the Rotary Club of Naperville Sunrise, where DiGiovani was a founding member. Registration soon will be in progress for 2019 Rotary Ride. Click here to more info coming soon about the bike ride slated for Sun., Aug. 11, 2019. Currently, the link is a showcase of photos and updates. Beneficiaries again will be Rotary International End Polio Now as well as three local nonprofit organizations, Naperville Responds for Veterans, Loaves & Fishes Community Services and 360 Youth Services. Other community service grants, recommended by club members, are supported by the club’s semi-annual giving program. Membership also is 100 percent vested the Every Rotarian Every Year initiative, a program that asks every Rotarian to support The Rotary Foundation. 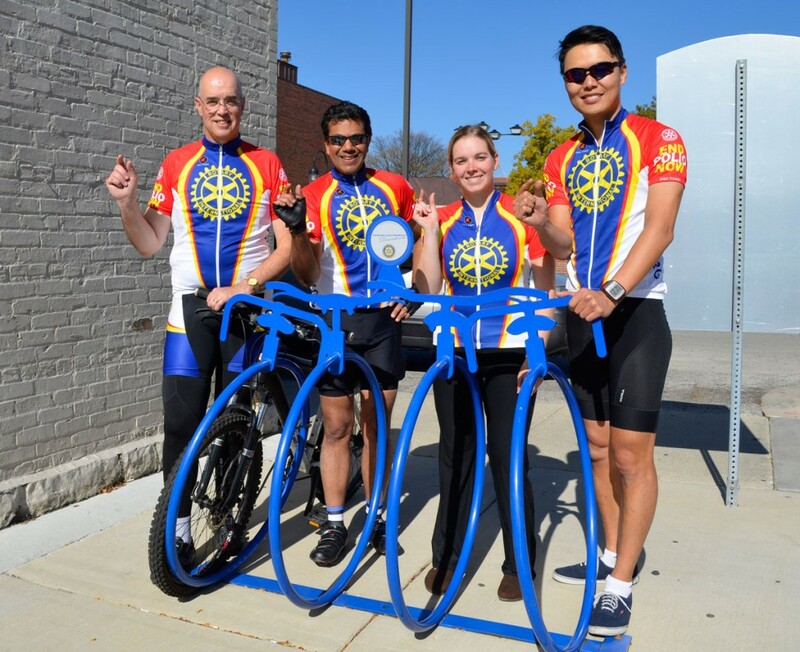 For a little history with the club’s focus on bicycling, (Click here for Naperville Rotary Ride photos from 2015.) the Rotary International Team under the leadership of RI General Secretary John Hewko has participated in Miles to End Polio as part of El Tour de Tucson. Click here to help End Polio Now. Thank you. 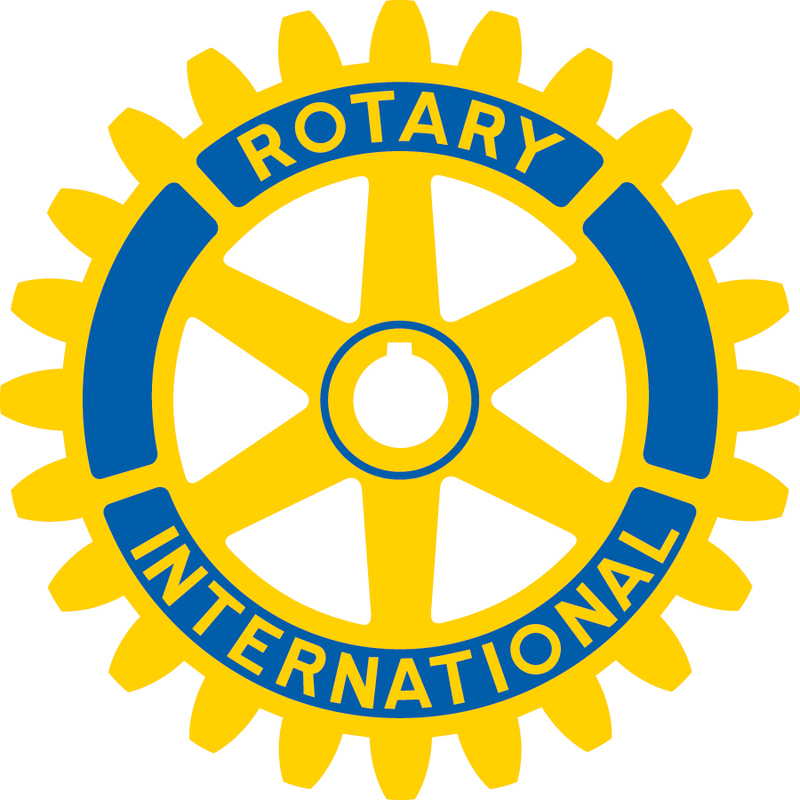 Rotary International, a service organization founded 1905, is comprised of 32,000 clubs in 200 countries. More than 1.2 million individuals have come together to become Rotarians by joining one of the clubs aimed at making positive and lasting changes in their communities and beyond. Members of RCN/Downtown and all Rotary Clubs always are welcomed to visit any Rotary Club in Illinois, the United States or the world where they’ll receive a friendly “hello.” Visiting other Rotary Clubs is a great way to learn about Rotary projects and fundraisers that can make a difference for unmet needs as well as to experience first hand what’s happening in other communities. Rotary Clubs meet weekly to build friendships, goodwill and peace worldwide with a motto of “Service above Self.” Guest fees vary from club to club. The guest fee for Rotary 4:44 is $20. To learn more about Rotary, visit Rotary International. 2018-19 Rotary Club of Naperville / Downtown President Jeff Davis reminds readers to be inspired and to learn more about the 63 clubs in Rotary District 6450, the birthplace of Rotary, with a visit to www.rotarydistrict6450.org. When RCN/Downtown members identify charitable causes for their grants, they qualify the cause by asking, “Will the grant make a difference and will it fulfill an unmet need?” In the broad spirit of all Rotary Clubs around the world, RCN/Downtown has its own personality with a focus on local youth, healthcare, education, college scholarships and the arts. RCN/Downtown is 100 percent vested in Paul Harris Fellowships, denoting contributions from every member to the Rotary Foundation, an endowment established in 1917. Anyone who contributes $1,000 or more over time to The Rotary Foundation Annual Programs Fund may become a Paul Harris Fellow. Typically, Rotary clubs recognize Paul Harris awards once a year. RCN/Downtown hosts its annual Paul Harris Fellowship / Anniversary Dinner every February, the month of its charter in 2007 and to commemorate the founding of Rotary in Chicago on February 23, 1905. Find the Rotary Club of Naperville/Downtown with more photos on Facebook, too.